(Indian Defense Minister) Arun Jaitley thumps his chest and proclaims that we have given the Pakis a "jaw-breaking reply" (munh tod jawab). Oh yeah? The Pakistanis are still there - with their jaw quite intact and a nuclear arsenal nestling in their pockets. (Indian Home Minister) Rajnath Singh adds that the Pakis had best understand that "a new era has dawned". How? Is retaliatory fire a BJP innovation? Or is it that we have we ceased being peace-loving and become a war-mongering nation? And (Indian Prime Minister Narendra) Modi thunders that his guns will do the talking (boli nahin, goli). Yes - and for how long? Indians, particularly Hindu Nationalists, have become victims of their own hype as illustrated by Times of India's US correspondent who checked into the veracity claimed achievements of Indians in America and found such claims to be highly exaggerated: "On Monday, the Indian government itself consecrated the oft-circulated fiction as fact in Parliament, possibly laying itself open to a breach of privilege. By relaying to Rajya Sabha members (as reported in The Times of India) a host of unsubstantiated and inflated figures about Indian professionals in US, the government also made a laughing stock of itself." The Times of India's Chidanand Rajghatta ended up debunking all of the inflated claims about the number of Indian physicians, NASA scientists and Microsoft engineers in America. Similarly, a US GAO investigation found that India's IT exports to the United States are exaggerated by as much as 20 times. The biggest source of discrepancy that GAO found had to do with India including temporary workers' salaries in the United States. India continuously and cumulatively adds all the earnings of its migrants to US in its software exports. If 50,000 Indians migrate on H1B visas each year, and they each earn $50,000 a year, that's a $2.5 billion addition to their exports each year. Cumulatively over 10 years, this would be $25 billion in exports year after year and growing. Since the end of the Cold War, the West has been hyping India's economic growth to persuade the developing world that democracy and capitalism offer a superior alternative to rapid development through state guided capitalism under an authoritarian regime---a system that has worked well in Asia for countries like the Asian Tigers and China. This has further fooled Hindu Nationalists into accepting such hype as real. It ignores the basic fact that India is home to the world's largest population of poor, hungry and illiterates. It also discounts the reality that Indian kids rank near the bottom on international assessment tests like PISA and TIMSS due to the poor quality of education they receive. The hype has emboldened many Indians, including the BJP leadership, to push neighbors around. Pakistan has so far not responded to the Indian rhetoric in kind. It might create an impression that Pakistan is weak and unable to respond to such threats with its conventional force. So let's examine the reality. In the event of a ground war, Pakistan will most likely follow its "offensive defense" doctrine with its two strike corps pushing deep inside Indian territory. Though Indian military has significant numerical advantage, Pakistan's armor is as strong, if not stronger, than the Indian armor. Before embarking on further offensive, gains shall be consolidated. Pakistan is also as strong, if not stronger, in terms of ballistic and cruise missiles inventory and capability, putting all of India within its range. These missiles are capable of carrying conventional and nuclear warheads. In 1990 the Central Corps of Reserves was created to fight in the desert sectors, where enemy land offensives are expected. These dual capable formations trained for offensive and holding actions are fully mechanized. The Pakistan Army has ten Corps including the newly formed Strategic Corps. The Army has twenty-six divisions (eight less than India). Two more divisions were raised as Corps reserves for V and XXXI Corps. The Army has two armored divisions, and ten independent armored brigades. Presently one hundred thousand troops are stationed on the Pak-Afghan border to fight terror. The Special Service Group – SSG - comprises two airborne Brigades, i.e. six battalions. Pakistan Army has 360 helicopters, over two thousand heavy guns, and 3000 APC’s. Its main anti-tank weapons are Tow, Tow Mk II, Bakter Shiken and FGM 148 ATGM. The Army Air Defense Command has S.A- 7 Grail, General Dynamics FIM-92 Stinger, GD FIM Red Eye, and ANZA Mk-I, Mk-II, Mk-III and HQ 2 B surface to air missiles. Radar controlled Oerlikon is the standard Ack Ack weapon system. 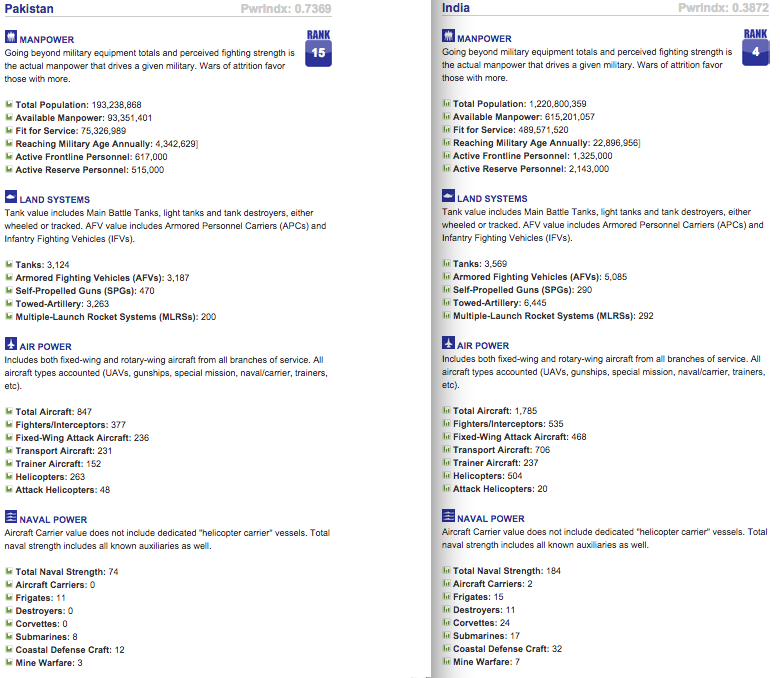 The ballistic missile inventory of the Army is substantial. It comprises intermediate range Ghauri III and Shaheen III; medium range Ghauri I and II and Shaheen II, and short range tactical Hatf I- B, Abdali, Ghaznavi, Nasr, Shaheen I and M -11 missiles. All the ballistic missiles can carry nuclear warheads....some can carry multiple warheads. Nuclear and conventional weapon capable Babur Cruise missile is the new addition to Pakistan’s strategic weapon inventory. It has stealth features to evade radar to penetrate India's air air-space to hit targets. The number of ballistic missiles and warheads are almost the same as those of India. So there is a parity in nuclear weapons, which is a deterrent. Tactical missile which can be tipped with miniaturized nuclear warhead is the latest addition to Pakistan's arsenal. It's a battlefield weapon designed to destroy enemy troop concentrations poised against Pakistan. Pakistan has about 900 aircraft compared to India's 1800, giving India 2:1 numerical advantage over Pakistan. India's biggest advantage is in transport aircraft (700 vs 230) while Pakistan has some numerical advantage in two areas: Airborne radars (9 vs 3) and attack helicopters (48 vs 20). Pakistan Air Force has over 100 upgraded F-16s and 200 rebuilt Mirage- 3's (for night air defense) and Mirage-5's for the strike role. They can carry nuclear weapons. They have been upgraded with new weapon systems, radars, and avionics. Additionally, the PAF 150 F-7's including 55 latest F-7 PG’s. Manufacture of 150 JF 17 Thunder fighters (jointly designed) is underway at the Pakistan Aeronautical Complex Kamra. The JF-17 Thunder is a 4th generation fly by wire multi-role fighter aircraft. Eight are already in PAF service. An order has been placed with China for the purchase of 36 JF-10, a Mach 2.3 -5th generation multi-role fighter, comparable in performance to the Su-30 Mk-1 with the Indian Air Force. In spite of Indian Air Force's numerical superiority since independence in 1947, Pakistan Air Force has performed well against it in several wars. The PAF pilots have always been among the best trained in the world. In 1965, Roy Meloni of the ABC reported: "Pakistan claims to have destroyed something like 1/3rd the Indian Air Force, and foreign observers, who are in a position to know say that Pakistani pilots have claimed even higher kills than this; but the Pakistani Air Force are being scrupulously honest in evaluating these claims. They are crediting Pakistan Air Force only those killings that can be checked from other sources." Of the three branches of the military, India's advantage over Pakistan is the greatest in naval strength. Pakistan has just 84 sea-going vessels of various kinds versus India's 184. Pakistan Navy can still inflict substantial damage on the Indian Navy. The Indian Navy has 17 submarines. Pakistan Navy has ten, some are brand new and equipped with AIP. Indian Navy has 28 war ships, Pakistan Navy has eleven. "Most analyses do not account adequately for how difficult it would be for the (Indian) navy to have a substantial impact in a short period of time. Establishing even a partial blockade takes time, and it takes even more time for that blockade to cause shortages on land that are noticeable. As the British strategist Julian Corbett noted in 1911, "it is almost impossible that a war can be decided by naval action alone. Unaided, naval pressure can only work by a process of exhaustion. Its effects must always be slow…. ". Meanwhile, over the last decade, Pakistan has increased its ability to resist a blockade. In addition to the main commercial port of Karachi, Pakistan has opened up new ports further west in Ormara and Gwadar and built road infrastructure to distribute goods from those ports to Pakistan's heartland. To close off these ports to neutral shipping could prove particularly difficult since Gwadar and the edge of Pakistani waters are very close to the Gulf of Oman, host to the international shipping lanes for vessels exiting the Persian Gulf. A loose blockade far from shore would minimize risks from Pakistan's land-based countermeasures but also increase risks of creating a political incident with neutral vessels." The probability of India prevailing over Pakistan in a conventional war now are very remote at best. 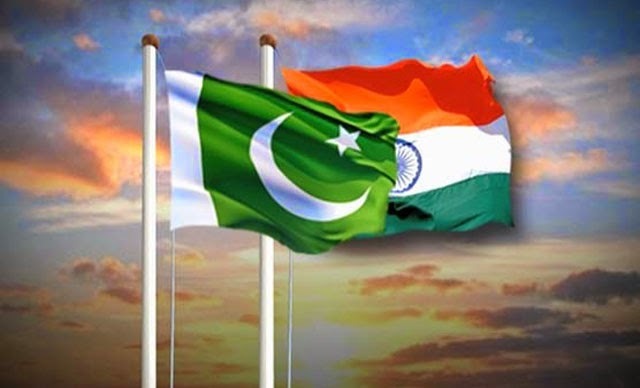 Any advantage that India seeks over Pakistan would require it to pay a very heavy price in terms of massive destruction of India's industry, economy and infrastructure that would set India back many decades. In the event that the India-Pakistan war spirals out of control and escalates into a full-scale nuclear confrontation, the entire region, including China, would suffer irreparable damage. Even a limited nuclear exchange would devastate food production around the world, according to International Physicians for the Prevention of Nuclear War, as reported in the media. It would set off a global famine that could kill two billion people and effectively end human civilization as we know it. I hope that better sense will prevail in New Delhi and India's BJP government will desists from any military adventurism against Pakistan. The consequences of any miscalculation by Narendra Modi will be horrible, not just for both the countries, but the entire humanity. India-Pakistan Tensions; End of TUQ Dharna; Honors for Malala; Ebol... from WBT TV on Vimeo. "Mr. Modi doesn’t seem to know that India’s reputation as a “golden bird” flourished during the long centuries when it was allegedly enslaved by Muslims. A range of esteemed scholars — from Sheldon Pollock to Jonardon Ganeri — have demonstrated beyond doubt that this period before British rule witnessed some of the greatest achievements in Indian philosophy, literature, music, painting and architecture. The psychic wounds Mr. Naipaul noticed among semi-Westernized upper-caste Hindus actually date to the Indian elite’s humiliating encounter with the geopolitical and cultural dominance first of Europe and then of America." It has been evident for some time that India’s security policy in relation to China and Pakistan is in a serious state of disrepair. If security concerns of a country in the international sphere are deemed to be a sub-set of its external relations, then it is reasonably clear that our policy towards two of our most significant neighbours, one of which aspires to the status of an international superpower, leaves much to be desired. More, things have got worse, not better, since the Modi regime was ushered in last May on a high note and with the loud proclamation that the incoming government was oriented to fix troubles with neighbours and launch into a period of peace and stability. The unspoken part was that matters had worsened in the previous 10 years of the Congress-led government, that dialogue was sterile or absent in this time, and the prosecution of foreign affairs had lost steam; ergo, a fresh look by the new leader, made powerful by virtue of a full-fledged parliamentary majority, would yield India its rightful place and command respect from all, especially the neighbours. On Friday, however, Union home minister Rajnath Singh, addressing the ITBP on its raising day, observed that it made India “hurt and angry” when Pakistan engaged in ceasefire violations and China intruded and made territorial claims on the Indian side. Clearly, a new era is not about to dawn. That was apparent when Prime Minister Narendra Modi was engaging with visiting Chinese President Xi Jinping seated on a swing in Ahmedabad but Chinese troops were rolling into Indian territory. Now the home minister says we should solve all problems on the basis of talks alone, but inserts the rider that good relations can only be on the basis of “honour”. Who can dispute that? But how come the government has not been able to establish where matters lie now and how they can be taken forward? Is the PM keeping all this close to his chest while the home minister labours in a state of innocence? In the context of Pakistan, the Prime Minister announced that India had “shut Pakistan’s mouth”. Not particularly elegant coinage. But it is not even consistent with facts on the ground. Ceasefire violations have gone on intermittently and took place even on Diwali day. Meanwhile, the Pakistan Parliament has declared India the violator and urged the UN to step in. Is there a comprehensive effort to look at the overall picture and act? National security adviser Ajit Doval has reiterated the talks mantra but also spoke of India’s search for a “deterrence” to deal with Pakistan’s ceasefire violations. We are in the dark if there is a nuclear ring about this. The country must be taken into confidence. India has grounded its entire Sukhoi-30 fleet after a recent crash because it doesn’t want to put its pilots in harm’s way. The fighters have not flown for a week after a Su-30 MKI of the Indian Air Force crashed near Pune, raising questions about the safety record of the fighter. With the IAF operating close to 200 twin-engine Su-30s, the grounded planes represent almost a third of the country’s fighter fleet. India is due to get 72 more of these planes, each worth over Rs. 200 crore. The IAF is down to 34 combat squadrons, as against an authorised strength of 44. Each squadron has up to 18 fighter planes. An IAF official said safety checks with “special focus on ejection seats” were being conducted and flight operations would resume only after each plane was cleared. A highly-placed source said the pilots of the plane that crashed on October 14 near Pune had reported “automatic seat ejection.” One of the two pilots was involved in a previous Su-30 crash too. Five Su-30 fighters have crashed during the last five years, setting off alarm bells in the IAF. The Su-30 fleet has been grounded at least twice in the past. Asked if buying Su-30s was a doubtful choice, Major said the planes were splendid but IAF needed to get to the bottom of the problem. Hindustan Aeronautics Limited assembles and repairs these planes in India. IAF chief Air Chief Marshal Arup Raha had told reporters on October 4 that the Su-30 fleet was facing certain problems, but he refused to elaborate. The IAF’s Su-30 fleet has faced a high number of mid-air engine failures during the last two years, said another official. IAF not keen on 1 vs 1 dogfights with the USAF. Pakistan will launch a campaign internationally against the human rights “violations” by the Indian army in Kashmir, the country’s Adviser on Foreign Affairs said on Friday. Radio Pakistan quoted the adviser as saying that the violations were a reflection of the “election manifesto” of Narendra Modi, who he claimed had said that his government would “get tough” on Pakistan. Aziz has said that India carried out 224 ceasefire violations on the Line of Control (LoC) and Working Boundary this year and their intensity has been more than the previous violations. He also said that Pakistan always tried to resolve the issue through dialogue but there was no positive response from the Indian side. As India considers its threat environment, it must consider not just ballistic missiles, but also cruise missiles, such as those that might potentially be launched from Pakistan or China. These latter are far more difficult to detect and intercept than are ballistic missiles. A cruise missile has been defined as a “weapon which automatically flies an essentially horizontal cruise flight profile for most of the duration of its flight between launch and its terminal trajectory to impact.” Land-attack cruise missiles further complicate the task of any defense system, since they can be terrain hugging and can also fly a circuitous trajectory. In particular, Pakistan’s Babur and Raad cruise missiles represent a threat to India. Meanwhile, China’s cruise missile arsenal include the Seersucker, Silkworm, the ground launched DH-10 and the air-launched CJ-10, C-101 and HN series, to name a few. Some of China’s missiles are nuclear capable. As it considers these weapons, one of the key questions that confronts New Delhi is whether it should opt solely for a cruise missile defense or also adopt a “deterrence by punishment” posture with the help of its own cruise missile arsenal. While a cruise missile defense could possibly intercept a subsonic cruise missile, it may be difficult to intercept supersonic cruise missiles and it is virtually impossible to intercept hypersonic cruise missiles. Although at present neither Pakistan nor China possess a hypersonic cruise missile, that could very well change. China already has supersonic cruise missiles such as the C-101 and C-301. Pakistan has also acquired the new CM-400 AKG, a supersonic cruise missile claimed to be hard to intercept because of its velocity. For its part, India is currently working on a ballistic missile defense. India’s Defence Research and Development Organisation is developing a defense system with two layers, with Advanced Air Defence (AAD) as the first layer and the two-stage Prithvi Air Defence (PAD) as the second layer. However, neither PAD nor AAD would be able to intercept cruise missiles. Using anti-air missiles of various ranges, it may still be possible to intercept supersonic anti-ship cruise missiles (although intercepting land-attack missiles remains a Herculean task). France, for instance, has been able to intercept supersonic anti-ship cruise missiles using its Principal Anti-Air Missile System. For it to replicate the feat, India would need an effective command, control, communication, intelligence, surveillance and reconnaissance system. Even with that, intercepting hypersonic cruise missiles would very likely remain unrealistic. Moreover, missiles with low radar signatures make the job of any air or missile defense system that much more difficult. Any surface-to-air missiles used would need to be highly sophisticated, with high-power large aperture radars, although even that might not be enough to intercept incoming threats. India could hope to defeat air-launched cruise missiles by destroying the aircraft that carry them. However, both Pakistan and China are developing stealth technology that could make it difficult for India to locate and destroy the aircraft before they fire. Excerpt From Op Ed by David Karl in The Diplomat: "3 Reasons Modi is Misguided on Pakistan"
In August, New Delhi abruptly cancelled foreign secretary-level talks on the grounds that the Pakistani ambassador had continued with the longstanding practice of meeting with Kashmiri separatists. This reaction may have been right in principle. But in practical terms, it amounted to a demand that Pakistan – which draws much of its national identity from the Kashmir conflict – make a significant diplomatic concession without receiving anything of importance in return. This was certainly no deal that any civilian government in Islamabad could accept as the price for merely beginning a conversation with Modi’s team, much less one that was then embroiled in a deep political crisis at home and uncertain of the military leadership’s allegiances. Indeed, the Indian government is in danger of becoming captive to its hawkish rhetoric. Defense Minister Jaitley emphasizes that “Of course we can talk to Pakistan, but it is up to Pakistan to create an atmosphere for talks.” Given the turmoil inside Pakistan, it will be difficult to start any sort of meaningful dialogue with Islamabad as long as that condition is strictly insisted upon. A third problem is even more fundamental. Mr. Modi appears to believe he can revitalize India’s great-power prospects without the trouble of reaching a basic accommodation with Pakistan. Yet New Delhi’s continuous ructions with Islamabad have constantly proven vexatious to its larger ambitions. They sap precious national resources (including the armed forces) and divert the attention of those leaders who prefer to look to larger arenas. They also create a paradox: India yearns for a place in the first ranks of world power and yet cannot establish much sway over its own neighbors. Despite the common civilizational and historical links that permeate South Asia, New Delhi has been unable to integrate the region in the same way that Beijing has economically stitched together the much more culturally diverse and geographically disperse East Asian area. Ignoring Pakistan may well score short-term political points at home but it is a poor strategy for the longer-term items on Mr. Modi’s agenda. Crafting the right blend of deterrence credibility and substantive engagement with rival states is a hard task for any government. But so far, the Modi government seems fixated one objective while paying little heed to the other. The Government of Pakistan has requested a possible sale of up to 36 F-16C/D Block 50/52 external link aircraft – a buy of 18 jets, with an option for another 18. The planes would be equipped with the APG-68(V)9 radars, which are the most modern F-16 radar except for the UAE’s F-16E/F Block 60 “Desert Falcons” and their AN/APG-80 AESA. The engine contract was less certain. Pakistan’s existing F-16s use the Pratt & Whitney F100 engine, but the new planes involved a competition between Pratt & Whitney’s F100-PW-229 external link or General Electric’s F110-GE-129 external link Increased Performance Engines (IPEs). 36 Advanced Integrated Defensive Electronic Warfare Suites: ALQ-211 AIDEW without Digital Radio Frequency Memory (picked); or AN/ALQ-184 Electronic Counter Measures pod without DRFM; or AN/ALQ-131 Electronic Counter Measures pod without DRFM; or AN/ALQ-187 Advanced Self-Protection Integrated Suites without DRFM; or AN/ALQ-178 Self-Protection Electronic Warfare Suites without DRFM. Associated support equipment, software development/integration, modification kits, capability to employ a wide variety of munitions, spares and repair parts, flight test instrumentation, publications and technical documentation, CONUS-personnel training and training equipment, U.S. Government and contractor technical and logistics personnel services, and other related requirements to ensure full program supportability. 200 AIM-9M-8/9 Sidewinder Short-Range Air-Air Missiles; they are the version before the fifth-generation AIM-9X. 240 LAU-129/A Launchers – these support AMRAAM or Sidewinder missiles.